I like to do things ahead of time. I’m not really a procrastinator and I’m not one of those people who thrive on last minute stress. I like to bake my cakes in advance and I thought why not share with you how I freeze them. I think there are a lot of people who don’t realize that you CAN freeze cakes and cupcakes successfully. 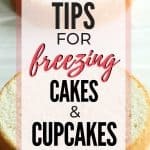 Freezing cakes and cupcakes is such a time saver, especially if you have a cake business as a side job, or if you just like doing things ahead of time. 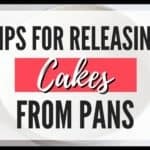 I never have freezer burn on my cakes, probably because I go a little overboard on wrapping them, but I thought I’d share with you my tips and tricks. When I pull my cakes out of the oven, I set them on racks to cool for 10 minutes. I don’t let them sit in their pans any longer than that. After ten minutes, I then turn them out of their pans and onto the racks to cool completely. I’ve heard of people actually wrapping their warm cakes and sticking them directly into the freezer, but honestly that makes me a little nervous. Isn’t it moisture that causes freezer burn? I just don’t want steam in there when I wrap them up, so I let them cool almost completely. I may have mentioned it a time or two, but I have a love-affair with Press-n-Seal Wrap. I can’t seem to work regular saran wrap. Call me weird, but it always just crinkles up on me and sticks to itself. I find TOO clingy. Press-n-seal is just so much easier to use. I then set a second piece of press-n-seal sticky side up on my counter, set the cake (seam side down) on it and wrap it up. Next I take a strip of foil and wrap them up. Here’s my method: I press down the ends of the foil, fold them in like a present and then roll up the ends. Wrapping it like that, keeps the foil from denting into the cake, or causing the cake to get misshapen. After I’ve wrapped it once with foil, I’ll place the cake layer (seam side of the foil face down) and then wrap it up all over again. I’ll then put a piece of tape on the top and write what kind of cake it is, the size and the date. Yes I do use a lot of materials, but like I said, I never get freezer burn. 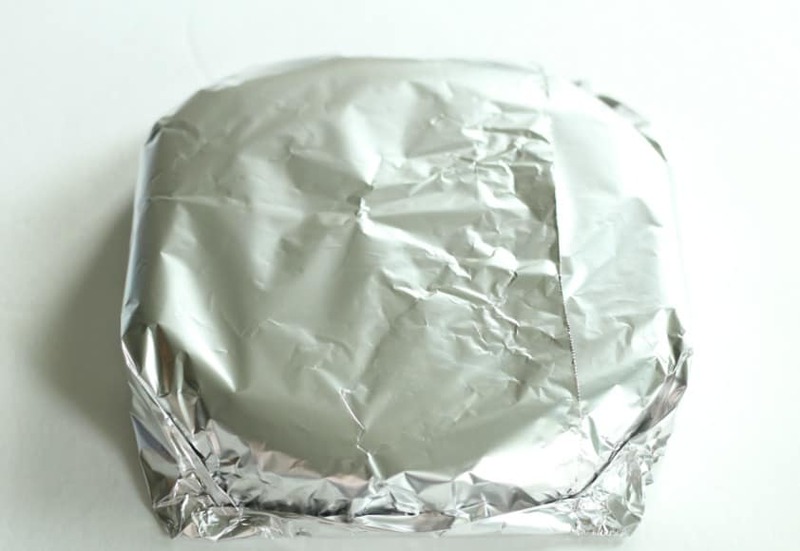 It’s possible you only really need one layer of foil, and that’s totally okay if you’re making cakes for home, but when I was selling cakes, I wanted to be dang sure, they were as fresh as I could get them and just went the extra mile. By the way, you can find the video on the process toward the end of the post! Freezing cupcakes is almost the same procedure. I take my cupcakes out of the oven and let them set in the pan, on the rack for ten minutes. Then I take my cupcakes out of the pan and set them on the racks to cool almost completely. I spread out a strip of press-n-seal (sticky side down) and set 6 to 8 cupcakes on it and then wrap it up. I then set another strip of press-n-seal on the counter (sticky side up) and wrap them up again. Next, I place one or two of these cupcake packets into a gallon freezer bag. I label the bag with the flavor and date. Again, it may be a little overkill with the wrapping, but I’d rather be safe than sorry and I’ve never had a cake or cupcake come out of the freezer with freezer burn. Another tip is that I don’t like to keep my cakes frozen over three weeks. 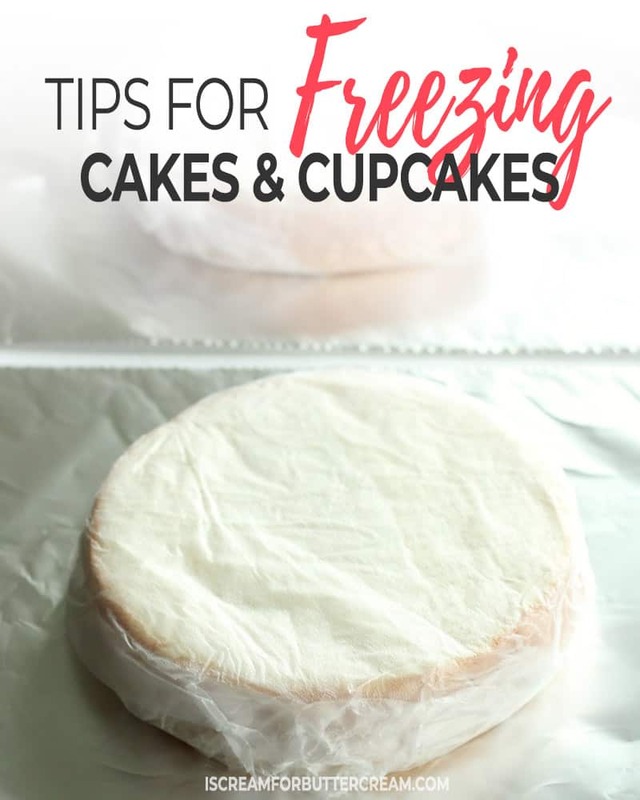 I think most people would assume you just take the cakes or cupcakes out of the freezer and their packaging to let them defrost, but YOU DON’T WANT TO DO THAT! Ok, I’m sorry I yelled at you, but I had to get your attention. Here’s what you DO want to do: Take your cakes or cupcakes out of the freezer, but leave them in their packaging to defrost. The reason? 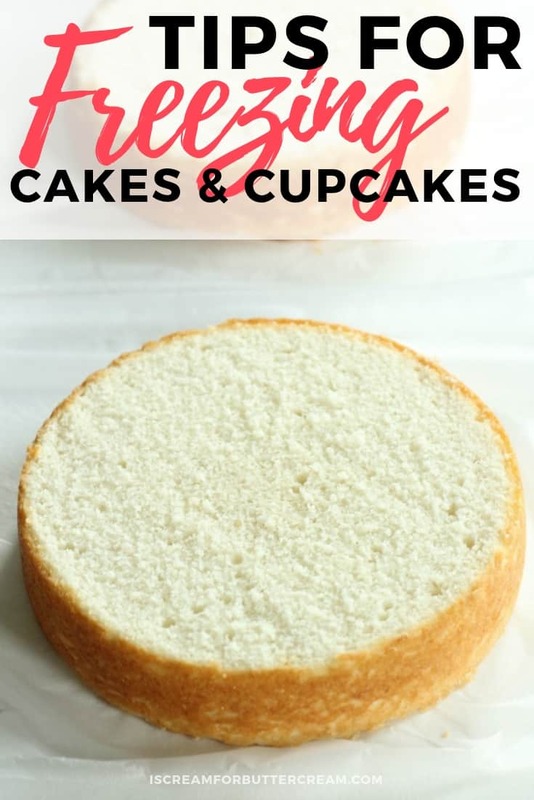 Well, defrosting will cause some condensation and if you leave them in their packaging, then the condensation will form on the outside of the packaging and NOT on your cakes or cupcakes. 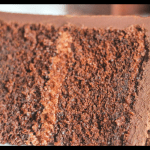 Too much moisture on your cakes can cause air bubbles when you try to ice it. The icing may go on smoothly, but a couple hours later, you’ll look at the cake and there will be a blow out or icing bubble on the side of it. 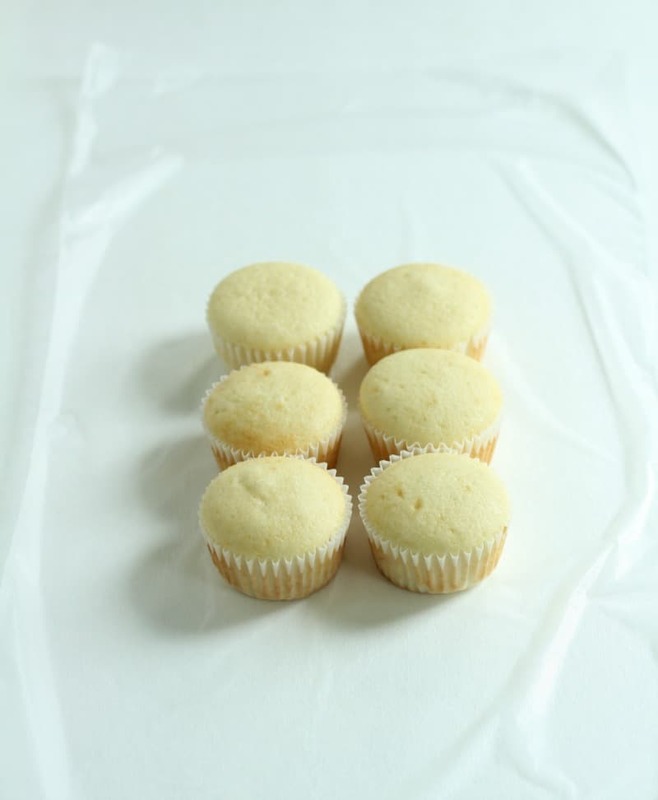 As for cupcakes, if you allow condensation to build on the actual cupcake, it could cause the liners to pull away from the cupcake, or perhaps the icing won’t stick to the cupcake. 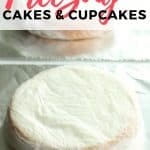 Ok, now it’s your turn to try freezing your cakes and cupcakes and tell me what you think! I think you’ll be surprised at how fresh they taste…liked you just baked them actually. Oh and here’s a quick video I made to show you the whole process! 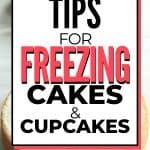 GET THE FREE FREEZING CAKES & CUPCAKES TIP SHEET PLUS THE PASSWORD TO THE RESOURCE LIBRARY. Just fill out the form below! New at this. Frustrated with freezer snafus. (Had always stared at the PressnSeal to use for freezing) You made my day! Thank you! How long are they good for once they are frozen??? I usually keep them frozen for about three weeks or so and they always taste fine for me. Believe it or not I had a bride have to postpone her wedding for nearly a year. Sorry to say the cake was on the counter ready to frost. I told her I’d wrap and freeze for a month or so but that she would have to take to her own freezer for the balance if time. We even froze the frosting. Wow, they lasted that long!? I’m impressed! That is so funny that they couldn’t keep from eating some of it. hahaha! I despise cling wrap as well. I make a huge mess and still don’t have anything wrapped!! I’ve developed an obsession for press n seal!! It’s just so reliable & easy to use!! I love to bake, but have been nervous about freezing! Thanks for this! I’m planning to bake and decorate the cake for my daughter’s first birthday. I’m kind of nervous as I’ve never done it before for a group of people. I’ll be freezing it so that I’m not rushing with the cooking and decorations. I just hope it doesn’t taste like my freezer after it’s been in there for a week!!! Just make sure and wrap it twice with the press n seal and twice with the foil and it’ll be fine. It’s only going to be in there for a week, so you should be good. Just remember when you take it out, let it defrost still wrapped up. I am so happy l found yiur blog. It is very imformative. I do have a couple of questions though. How far ahead does one start defrosting a cake? Also, defrost in the fridge or out? Glad I could help 😉 As far as defrosting goes…it depends on how big the cake layers are. Cupcakes will defrost rather quickly (maybe 30 minutes or so). Bigger cake layers may take an hour. Leave them in their wrappings when you defrost them. Just defrost them on the counter. I set mine out and about an hour later, I unwrap them, unless it’s a larger cake layer and then I leave it wrapped on the counter a little longer. after you defrost it, then? eat it directly or you have to warm it again? Just defrost it in its wrappings. Once it’s defrosted, take the wrappings off and you can either serve it right away, or ice it and serve it. You don’t need to warm it up. The cake will be fine sitting on the counter for a couple days if it’s covered in a cake server or wrap it again with press-n-seal. You will have to refrigerate it if there are perishable fillings or if you’re using an egg white based buttercream to ice it. If you use the American buttercream (with butter and confectioners sugar), it’s fine to leave it on the counter, covered, for a couple days. Another little tip I learned from managing an ice cream store is to frost the cake while still frozen. So much quicker because the cake is solid, and the frozen cake helps to chill and set up the frosting, plus traps in the moisture from the defrosting cake. Everyone always asks how my cakes and cupcakes are so moist! That’s my trick. Good tip. I personally haven’t had much luck icing frozen cakes. I seem to get icing blow outs when I do that, but it may because I don’t typically chill my cakes afterwards. I leave them room temp. It’s never worked for me when I’ve had to cover a cake in fondant, but that doesn’t mean it won’t work for others. Good tip if you plan to keep your cakes chilled afterwards. 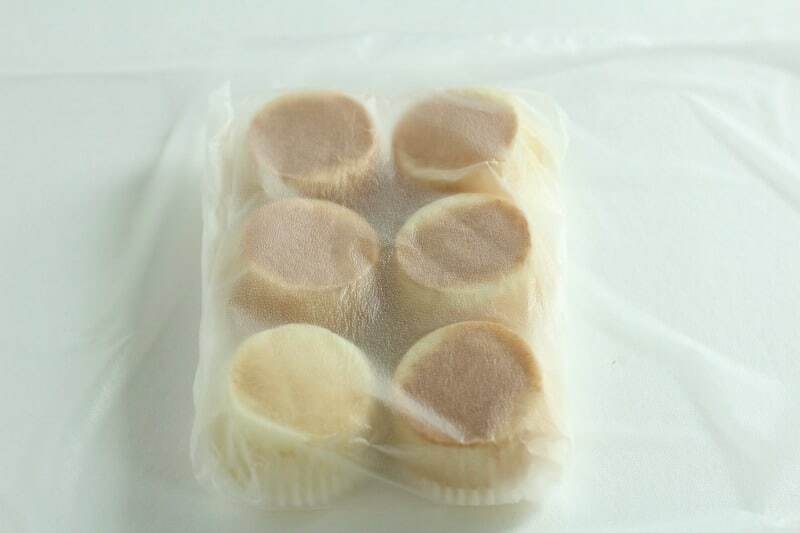 What is your experience with cupcakes and keeping the wrappers from coming off? I find my cupcake wrappers always seem to start coming off when my cupcakes are cooling. Oh yeah I’ve had trouble with certain cupcake liners doing that. It’s weird, but it seems like the more expensive and thick they are, the more they pull away. That may be all in my head…I don’t know. Anyway, I think it could be the type of liners, but also I think the bigger problem is moisture. There’s a good post by my friend Rose at Rose Bakes who wrote more about it. She actually gives a bunch of different reasons why it happens. It’s a really helpful article. Here’s the link if you’d like to read that post: https://rosebakes.com/cupcake-liners-pull-away-cupcakes/ I hope it helps! Hi Debbie, I prefer to freeze my buttercream separate from my cake. 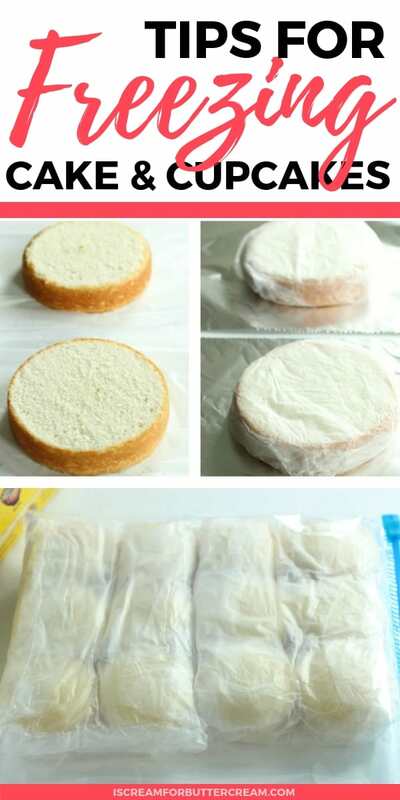 You can put mounds of buttercream on plastic wrap, wrap it and then twist the ends and put it in a ziplock freezer bag. If the buttercream is already on the cake, you can probably freeze it all together and the taste should be just fine. It won’t be a smooth buttercream finish though. Also, when you take it out of the freezer, you’ll need to leave it on the counter to defrost a bit, but leave the wrapping on it. Let the condensation form on the outside of the wrapping, then you can unwrap it before the buttercream gets too soft. As far as freezing a cake that is covered with fondant, I have never personally tried it, but my friend Rose has and it seemed to work for her. Here is a link where she talks about it: http://rosebakes.com/can-freeze-fondant-decorated-cake/ Hope this helps you! I do the same thing when freezing my cakes. I do go one step beyond, because my freezer is so tightly packed. I freeze my cakes on a board. I simply wrap the board with tin foil before I place my wrapped cake on it. That way Im sure to not wreck my cake before it’s frozen. You are right though. It works everytime! Thanks so much for your ideas I am new at this. How do you store your muffins? I love make banana muffins. When I store them in ziploc bags and the next day they are WET. I’ve tried other bags and containers, next I tried other recipes. Haven’t found anything yet. Hi Cindy, I don’t make muffins often, but I do make cupcakes a lot and I store them a little differently than I do my cakes. You might try it with muffins and see if it makes a difference. Here’s a link to the post I wrote about it. https://iscreamforbuttercream.com/keep-cupcakes-from-drying-out/ Basically, I just keep them in a plastic container. I just set them in the container without wrapping them, then close the container and wrap the outside where the lid snaps shut. They may have a little moisture on the top, but they shouldn’t be wet. Just make sure they’re cooled down when you put them in the container. Hope this helps! How long does it usually take to defrost a cake ? And do you defrost it completely before unwrapping and using it ? Help! My first time doing this!!! It really depends on the size of the cake. Usually what I do is take the cake out of the freezer and just set it on my counter. Leave it wrapped. I let mine sit out like this for at least an hour and sometimes a bit more. 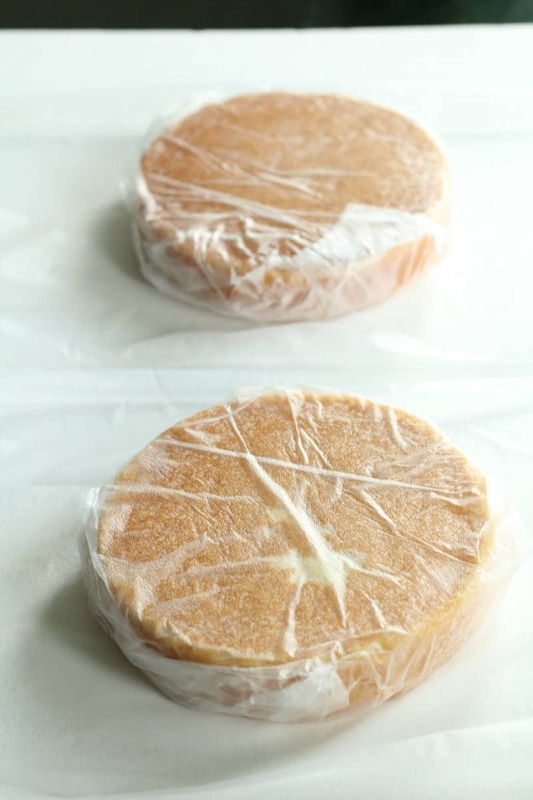 Condensation will form on the outside of the wrappings instead of on the cake when you allow them to defrost in their wrappings…that’s a good thing. I like to let mine come to room temp before icing them. I know some decorators like to ice their cakes cold, but I haven’t had much luck with that. 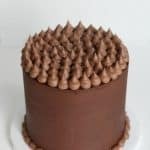 It seems like I get icing blowouts (big bubbles under the icing) when I do that, so I prefer mine to be completely defrosted and almost room temp before I start decorating. Hope this helps! I am making a 4 tier wedding cake for 29th September, how far ahead can I make it and freeze it??? Going onto to amazon to get press and seal, looks a great product, we don’t have it here in Ireland? But hooray ? for amazon!!!!!! hi karen thank you so much for wonderful tips. question If i take out my cake from freezer Do I have to remove the wrap or no in right away while defrost? how many hour to wait if ready to frost the cake. When you take your cakes out of the freezer, just set them on your kitchen counter with the wrapping still on. Don’t take the wrappings off until they’re defrosted because that’ll cause a lot of condensation on the actual cake. The amount of time it takes to defrost your cake will depend on the size of your cake layers. I would leave them on the counter, still in the wrappings, for at least an hour before taking the wrappings off. A lot of times, what I do is take them out that morning, set them on the counter to defrost in their wrappings and then that afternoon, I’ll take the wrappings off and decorate them. Hope this helps! I am so glad I found your website, because I been looking all night to see how can I defrost a cake. I made them about a week ago because I do not want to be in the kitchen all day Thanksgiving. It is my year to cook so I had to plan ahead. Wish me luck I will be taking them out the freezer at 7am and frosting them around 3pm when I get up for work. ?? Kara hello both cakes I froze last week turn out great when I got ready to put the icing on. ??? Thanks for the info! I enjoy baking, but I just do it for my family. I have, however, been an event planner/catering coordinator and have done Lots of weddings. People often think they can’t save their top cake for their anniversary because it will taste like the freezer, but they’re wrong! I know, I saved mine and it was perfect! I used layers of Saran Wrap (press and seal would be great too) and tin foil as you do, but the biggest key for extended freezing, paper bags! I used two. They absorb any smells that may be in the freezer and help keep it fresh. I don’t know about you, but I have to use my freezer for a lot of things, and I don’t want my cake tasting or smelling like anything other than cake! Hi, Kara! Thank you so much for this tutorial! I found it sometime last year and it has been such a huge help. I’m baking for five weddings between now and April (the first is tomorrow! ), as well as numerous Unicorn cakes over the coming weeks, and your wrapping tips are sensational. I had never used Press ‘N Seal until you mentioned it! Now, I use it all the time! Hi Kara! I am making my own wedding cake and have already completed the baking, wrapping and freezing part ? The cakes are freezing in my deep freeze at home, but my wedding is taking place in a different town where I’m going to be assembling the cake on a Friday! We are leaving our house on Thursday and my plan was to defrost my cakes on the Thursday and keep them cold until Friday when I assemble the cake. What would be your suggestion for a successful outcome in this situation?! Hi Nicole, Wow…you’ve got a job ahead of you…you’re one brave gal! 😉 Ok, I think defrosting them and keeping them chilled until Friday will work just fine. Honestly, I don’t assemble my cakes cold, so personally I would set them out on the counter an hour or so before assembling that way they’re closer to room temp, but if you’re more comfortable assembling them cold, do what’s most comfortable. I just find that icing cold cakes can sometimes cause buttercream blowouts and air bubbles. Some people have different methods though. Hope this helps! So glad I found your site!! Yours seem easier to understand and do. I have a question. So if I freeze both cake layers and frosting ahead, defrost them, then decorate; can I put them in the frig for one day all assembled, then place them to go to room temperature that day? Will it condensate in the frig? Help, I have never done this, always wanted to. This cake is for my granddaughters 1st birthday, and want it special. Hope it turns out, or there goes the emergency trip to the store! When I fill my cakes, I usually do a super thin crumb coat on the cake and then cover it loosely with saran wrap or press-n-seal. I leave it out of the fridge and wait a couple hours if I can to let the cake ‘settle’ before adding the final coat of buttercream to the outside. I do this because by letting the cake settle, you’re less likely to get air bubbles (buttercream blowouts) or icing ridges in your final cake. So…After you decorate the cake, it really doesn’t hurt it to keep it in the fridge. I tend to leave mine, out, but it’s fine to keep it chilled if you’re more comfortable with that. You do run the risk of it getting condensation on it once you set it out though. 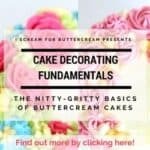 If you’re using dark buttercream colors, it might be an issue, but if it’s all white buttercream, usually that’s fine. If you keep it in the fridge, just keep it in a cake box and then I usually cover my box with press n seal or regular saran wrap. When you take it out of the fridge, just leave it in the box covered on the counter or table for at least half an hour before you open it up and hopefully then the condensation will stay on the outside of the box and not on the cake. I hope all that made sense! Hi Kara, I’m a new subscriber and I understand that this was an old post, but still hoping you’ll entertain me. I live in the Caribbean where it’s either always raining or very, very hot. I’ve had two experiences with cake bubbles or blow outs under my fondant (it’s ugly)… But because our room temperature here turns butter into oil, I’m thinking of using an air conditioned room… But what’s the highest temperature you might recommend? Also, why does moisture cause the blow outs tho? I’m sorry… I’ve been trying to get an answer for what causes the blow outs and you’re the first to offer a solution. I’m just trying to grasp the science. Hi Krystal. I understand the problem with blow outs…they can definitely be a real pain. I’ll tell you what I do to prevent blowouts that seems to really help. I decorate my cakes at room temperature. My room temp is about 72-77 F. I wouldn’t go too much warmer than that or your buttercream will get soft, like you mentioned in your comment. I seem to get the blow outs when I don’t let the cake layers settle. Basically what I do is just add the cake layers and filling and then cover the cake lightly with wrap. I don’t cover it in buttercream or anything else yet. I keep it room temp and let it settle either over night, or a couple hours at least. This lets any air that’s trapped between the layers come out. It just allows the cake and buttercream to settle. Once it’s settled, I then cover it in buttercream, ganache, or whatever I’m decorating with. I don’t refrigerate my cakes, unless there’s some kind of perishable filling. I’ve found when I chill them first and then decorate them, somehow condensation forms between the cake and the icing and that’s when a blow out can occur. I know that many cake decorators have no problem chilling cakes and decorating them cold etc., but I have always had issues when I do that. If it’s chilled, decorated and then chilled again immediately, you may not have any problems with blowouts until it comes to room temp. As far as the science behind the blowouts…I really don’t know exactly. It’s like a combination of the condensation (moisture) that’s on the chilled cake, not allowing the buttercream to really adhere and/or it could be air trapped in the cake the comes out because it wasn’t allowed to fully settle before adding the outside buttercream or fondant. My answer was pretty long, but I hope it’s at least a little helpful! Please how do I retain the colour of my red velvet cake, each time I freeze it and take it out for use, the colour dims. Hmmm that’s interesting. I’m not exactly sure I have an answer for you. I’d just make sure to cover it really well in addition to covering it with foil. Let it defrost while still in the wrappings and see if that helps. 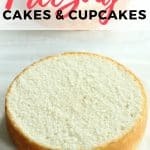 Am I able to bake and frost cupcakes and then freeze them? I have a function and I will be out of town up until the morning of the event. I was hoping to make the cupcakes a week ahead of time and freeze them. Any thoughts? 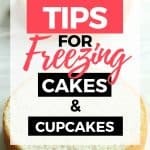 How would I successfully wrap frosted cupcakes to prevent freezer burn? I don’t normally freeze them with the icing on, but I know it can be done. The only thing I would worry about though is condensation that might cause the icing to slide off the cupcakes when they defrost, but I don’t know if that would actually happen. What you could try is once they’re baked and iced, pop them in the freezer for just a little bit, like maybe 10 minutes or so and let them get pretty firm. 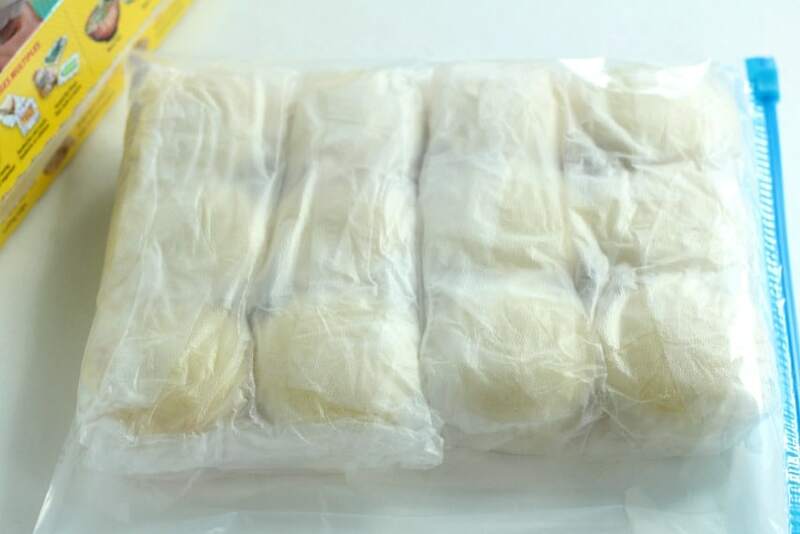 Then pull them out and wrap them up in plastic wrap and add them to a ziplock bag, then pop back into the freezer. The only thing is that normally when you take cake out of the freezer to defrost, you’d leave the wrappings on while it defrosts so that the condensation is on the outside of the wrappings and not the cake itself. However with the cupcakes already being iced, if you don’t take the plastic wrap off them before they defrost then the icing could get messed up, but then you’d be dealing with condensation on them that may or may not cause issues. You could freeze the cupcakes and the buttercream separately and then ice them once they all defrost, or you could get a plastic container that has a cover and freeze them in that. That may work better because then you could leave the lid on them while they defrost. I know this answer was a bit long, but I’m just thinking out loud. 😉 I hope this helps! Hi! I’m hoping you’ll still be able/willing to respond even though this is post is a few years old. Hi Madison. Yes cupcakes tend to do that quite often after they’ve been frozen, or even just chilled. (Well that’s my experience anyway.) At least you know your cupcakes are moist, right? Sometimes I just lay a paper towel over them and press down gently. That can soak up a bit of that moisture and it seems to help. You could just let them sit out for a bit after you’ve used the paper towel trick and let the tops dry out some, but I don’t like to do that because generally cupcakes dry out really quickly and I don’t want the whole cupcake to be dry. The second thing is after using the paper towel, I just don’t worry about the tops being moist or sticky. They’ll have icing on them and generally that will cover up anything, so it should be fine. Let me know if you have anymore questions! Hi Kara. I love this post of yours. 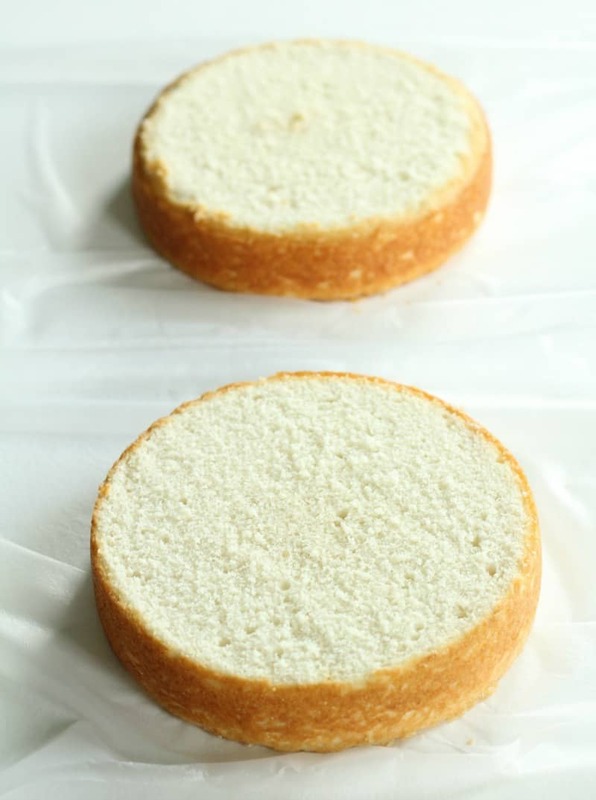 I have to bake my sister-in-laws wedding cake for April (my first wedding cake.nervous…) Can I use wax paper to cover my cakes before freezing them? Hi I’m so glad the post was helpful! I have never tried using wax paper. I’m not sure if it would seal it as well as the plastic wrap and foil though, so I can’t promise anything. I wouldn’t test it on her cake though. I mean if you have time to test it on a smaller cake beforehand, you could, but I know it’s safe to use the plastic wrap and foil though. Hope this helps.